History will be written in Boston tonight. At 10 PM, the #12For12 collective will invade the WERS 88.9 FM studio for a live, on-air cypher, the first of its kind in the city, coordinated by @MUSICisforLIFE as well as The Fresh Heir and The Collab Projekt (and again, Decriminals will be providing video coverage to be released in the future for anyone who can’t listen live). The regular Tuesday night show begins at 10 PM, and the actual CYPHER will take place starting at 11. See the flyer above for the names of all artists involved. In addition to the incredible amount of talent supplying the bars, esteemed producer Teddy Roxpin will be providing the original beat for the legendary event. Easy – if you’re in the Boston area, tune in to 88.9 FM. If you’re anywhere outside Boston (or if you’d just rather listen from your computer), go to WERS.org and click “Listen Live” at the top of the page whenever you feel like tuning in. 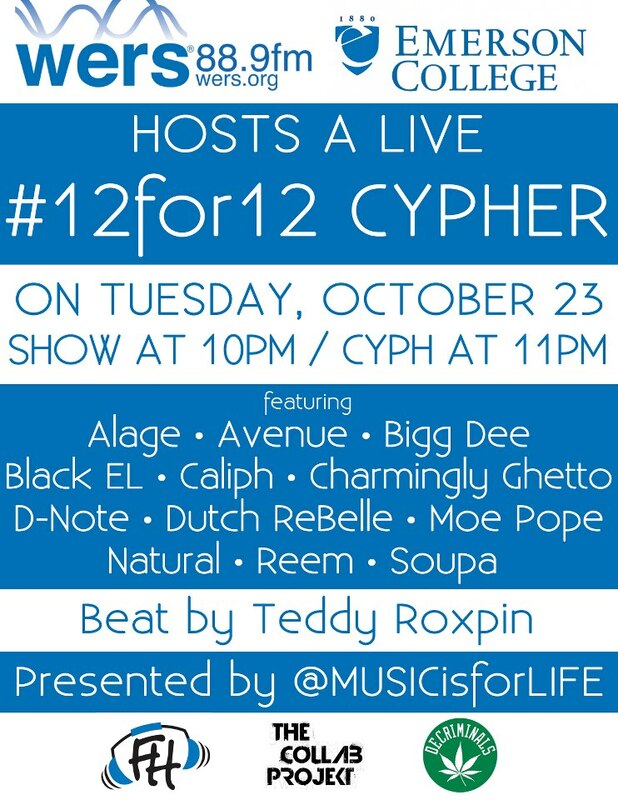 Tags: #12For12, 88.9 FM, Alage, Avenue, Bigg Dee, Black EL, Boston, Caliph, Charmingly Ghetto, Cypher, D-Note, Decriminals, Dutch ReBelle, Hip-Hop, Legendary, Live cypher, Malcolm Gray, Moe Pope, Natural, Reem, soupa, The Collab Projekt, the fresh heir, Tim Larew, WERS, WERS.org. Bookmark the permalink.